Ronan O'Gara to join Racing Metro? Munster and Ireland fly-half Ronan O'Gara has reportedly agreed to join Racing Metro's backroom staff on a two-year deal. According to reports on RMC Sport, O'Gara met Racing Metro owner Jacky Lorenzetti on Friday and has signed a deal to join the Top 14 side as a kicking coach with L'Equipe claiming he will also have a role within the youth setup. If the rumours are true, the move will see him work alongside incoming coaches Laurent Labit and Laurent Travers. And he will also work with current Ireland No.10 Jonathan Sexton who will join the Parisians next term. The news would also signal the end of O'Gara's hugely impressive career. He is the top points scorer in the Heineken Cup and helped his province to European titles in 2006 and 2008. On the international scene, he has two British & Irish Lions caps to his name and has also slotted 1083 points for Ireland - a national record. 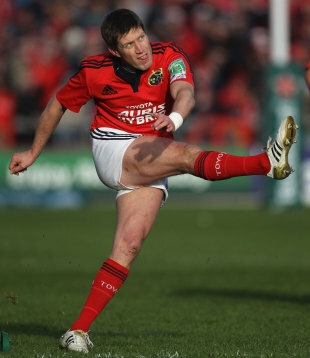 Reports in the Irish Independent, in the aftermath of Munster's Heineken Cup semi-final loss to Clermont, suggested O'Gara was ready to announce his retirement and pursue a coaching option away from Munster. O'Gara, though, was quick to dismiss any thought of calling time on his career after their final four defeat. "It's not the time for me to be thinking or talking about retirement. I owed it to my team-mates to be totally focused on the game today and I was," he told Sky Sports. "I love coming to France and playing and this competition have given me the best memories. I will sleep on it until the end of the season."